Ok… after the Scooter’s at 180th decided to schedule a piano recital of some sort without asking us (not like they care), we scrambled for another meeting location. Thankfully, Dave Homan (President of Slouch Couch studios) suggested we look into CAMP Coworking to host this week’s meeting. CAMP is a space designed for collaborative work. People can rent space by day, month, etc. They have pretty much everything we need… WiFi, plenty of power, desks, chairs (some of them are even squishy ones! ), and — most importantly — there will be no other people to worry about bothering. This comes in handy considering we are doing another Skype guest this month. CAMP Coworking is a little out of our normal territory. It’s in the NoDo (North of Dodge) neighborhood — specifically just a few blocks north of TD Ameritrade park and the Qwest Century Link Center. The actual address is 1111 N 13th Street in the Mastercraft building. Please note that 13th street does not really go through from the baseball field north. You end up in the Hampton Inn parking lot. While you can certainly manage to get out the other side of that lot, it is a little awkward. The best bet is to go around the hotels by a block or so. I really want to thank Dave and his wife for helping out with this. While he pretty much soft-pedaled the idea of paying for the use of the space, I think it would be appropriate if we were to chip in a few bucks each for their generosity. Is this bring your own drinks then to this facility? 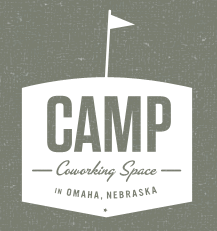 Wow, not only am I excited about attending the monthly meeting, but also excited to check out CAMP Coworking, as I’d never heard of ’em before! Oh, and I too am wondering if outside drinks are allowed?? Sorry… but the time is the same as usual. 6PM. The only difference is that they might not kick us out at 9 if we have our nerd-groove goin’ on. Bring your own drinks. Adult drinks are ok if it’s ok with our ogda friends, and assuming you are of age. We have a coffee maker and Starbucks coffe but it’s not the largest machine. Also we are fine staying past 9. Plenty of desks and power if you want to stop by a little early and get some stuff done. Cheers and see you all tomorrow.